Senior league action – Following last week’s league win over Moortown, the seniors and reserves travel to Clonoe tomorrow night (Fri) for what will be their toughest challenge to date. Throw-in is at 7pm (reserves) and 8.15pm (seniors) and a good support would be appreciated. 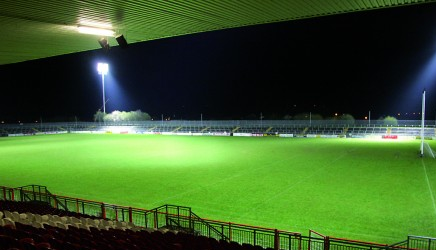 Healy Park work – Healy Park is currently a hive of activity each evening as the countdown for the Ulster championship game gets underway. However we need more volunteers to help with getting the facilities into shape. If you can spare a couple of hours any evening from 7pm please come along. Bring brushes/tools or any cleaning item you thing would be useful. Minors – The minor boys have reached the concluding stages of the league with the A team defeating Cappagh on Wednesday night and are also awaiting confirmation of championship dates. Hurling – Well done to the U16 hurlers who completed their 2014 league campaign on Monday with a win over Beragh. Next up for the team is a crucial championship quarter-final game against Shamrocks tomorrow (Fri) in St. Patrick’s Park (7pm). U14s – Hard luck to the U14 girls football team who, despite a fantastic performance, lost out to Clonoe in the league on Monday on the score of 3-13 to 3-11. Their next games are away to Cookstown on Saturday (11am) and at home to Glenelly on Monday (7.30pm). U14 boys footballers play Dromore on Saturday while the Devs are at home to Clann na Gael (both games 1pm). The U14 hurlers commenced their season on Wednesday night in a Tyrone blitz in Garvaghey and did exceptionally well, beating Naomh Colum Cille (twice) and Cappagh. Training for the U14s who are currently preparing to host a visiting team for the All-Ireland Feile at the end of June will continue each Thursday at 6.30pm. U8/U10 – The boys U8 team travel to Drumragh for a blitz on Saturday. Parents to transport players to Clanabogan for 10am sharp. U10 football and hurling coaching switches to St. Patrick’s Park on Saturday morning from 10am. Newcomers always welcome. Coaching for boys U8s and U10s will also commence on Tuesday evenings from next week in St. Patrick’s Park from 6.30pm. U12/14 Hurling coaching St. Patrick’s Park on Thursday from 6.15pm. Camogie – Friday’s Camogie training is at the earlier time of 5.45pm-7pm in St. Patrick’s Park. Girls football – Girls football coaching on Wednesday from 6-7pm in St. Patrick’s Park for U8, U10 and U12s. Senior ladies – Senior ladies play Sperrin Og in the league in St. Patrick’s Park on Saturday. (7pm). Lotto – Last week’s club lotto numbers are 7,11,16,19, 29. Two winners of £50 each are Mrs McGuigan and Cathal McKenna. One Direction – Anyone who has tickets for the One Direction draw are asked to return them (sold and unsold books) to their respective team manager this weekend. The draw for two Premium Level tickets in Croke Park will take place at Bingo next Thursday night.